Great news! 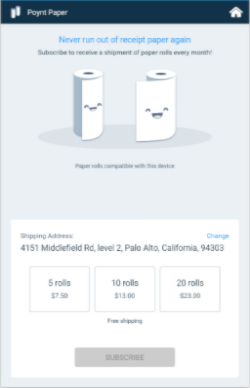 Our new Paper app on the Poynt Smart Terminal means you will never have to worry about running out of receipt paper. 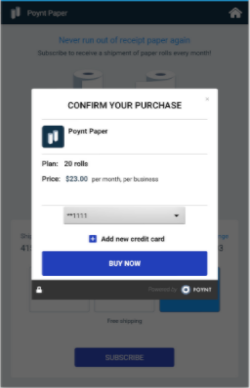 If you’d like to order more paper for your Poynt Smart Terminal built-in printer, you can download the Paper App from Poynt Apps to subscribe to receive paper apps in packs of 5, 10, or 20 on a monthly basis. 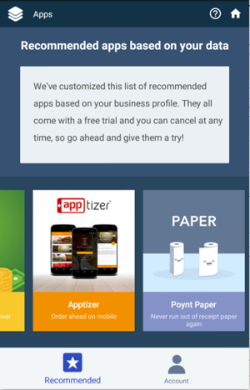 For instructions on downloading an app from Poynt Apps, check out our Apps Overview. Note: If you don't currently see Poynt Apps on your terminal, please reach out to your Reseller Organization to enable it for you. These coreless and BPA free paper rolls are compatible with your Poynt Smart Terminal's built-in printer. Dimensions = 2.25" (57mm) width, 16 ft length (per roll).